Butterfly each shrimp and season the shrimp with salt and pepper and dredge each side in the flour. Heat the oil in a skillet on medium heat and cook the shrimp approximately 2 -3 minutes on each side. Heat a platter in the oven or the microwave and transfer the shrimp to the platter. Heat the pan with the olive oil on medium heat, then add the minced garlic and stir. Once the garlic has sizzled, deglaze the skillet with the wine. Once the wine is nearly gone add the broth, lemon juice and capers and return the shrimp to the skillet for one minute on each side. Transfer the shrimp back to the platter and place the butter and lemon slices in the skillet. 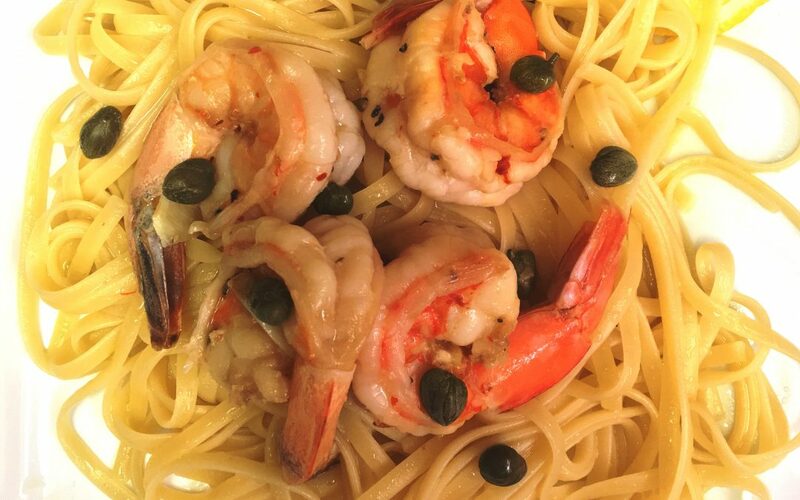 Once the butter has melted pour the sauce over the shrimp and serve over a bed of cooked linguine.